Now that Vinicius Junior’s return seems imminent at Real Madrid, it’s time to analyze the Brazilian’s role under Zinedine Zidane at the club. The image of Vinicius Junior getting injured against Ajax was a bitter ending to a great debut season for the youngster at Real Madrid. Manager Santiago Solari takes all the credit of introducing us to a very promising new talent who could take over the world in a few years with his mad skills. 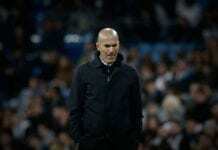 Zinedine Zidane’s return to the club initially brought many questions about Vinicius role in this new project but things are starting to become clear for the player. The young Brazilian winger just made his return to the Real Madrid training grounds this Friday and he seemed pretty excited to be back in action with the club. Diario AS reports that the Brazilian player is expected to return to action at the beginning of May and Zinedine Zidane completely trusts him. The French manager loved what he saw from Vinicius throughout the season and he is willing to help him grow at the club. The gaffer is convinced that Vinicius will become an important player for Real Madrid in the upcoming years and he loves the idea of being his mentor. President Florentino Perez reportedly spoke with Zidane about the player and they both agreed on his quality at the club. The arrival of new players to Real Madrid won’t be an obstacle that prevents Vinicius Junior to complete his development. We can already see how Eden Hazard’s potential arrival to the club could get in the way but Zidane thinks they can play together. The Belgium international can play comfortably on Vinicius’ left wing but he is way more versatile than that. Eden has proved that he loves playing all over the pitch and he would be a wasted talent if ‘Zizou’ would ask him to play strictly as a winger. Vinicius’ situation is different because he is still young and he needs to gain more confidence to play in other positions on the attack. This versatility that Hazard has will be very beneficial for the young Brazilian and Zidane is already planning to use them both on the attack. Real Madrid isn’t planning on making their move for Kylian Mbappe this summer yet precisely because of Vinicius. The club has decided to wait for this young player to develop. The manager shares the view that he can become one of the best players in the world in a couple of years. The youngster will get the same opportunities to impress the gaffer before the end of the season but there is no pressure to hurry. The French manager also spotted the youngster’s lack of aim in front of goal and that’s one of the first things he discussed when he returned. Vinicius Junior himself has agreed that he needs to improve this aspect of his game but he also reckons that he is in very good hands with his new manager. The first step towards improving his shooting already started under manager Santiago Solari as ‘Vinny’ took Benzema as his mentor. There is no better way for the young Brazilian to improve his finishing skills than by taking advice from the best striker the club has at the moment. Vinicius is a player who virtually has everything to become one of the best players in the world and improving his finishing will certainly get him there faster. Zidane trusts that the player’s disposition to learn is one of the biggest factors that will play into his growth. Another important thing to note about the young winger is the recovery process he’s gone through with his injury. Vinicius suffered an ankle ligament injury that has kept him out of competition for nearly two months. Coming back stronger is a top priority for the club and they won’t rush him in any shape or form. How long will it take Vinicius Junior to convince Zinedine Zidane? Please share your opinion in the comment section down below.